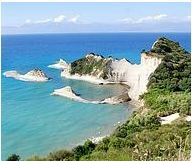 Corfu Magdalena B&B is located near the west coast of the Ionian island Corfu. If you are looking for quiet and relaxing holidays in unspoilt nature without noise and nightlife, you'll be at the right place. Find out about Greek hospitality and discover one of the most beautiful and diversified Greek islands. To reach remote places of the island, we recommend you to come by car. Or we can arrange car, bicycle, scooter or quad rentals for you. Corfus most enchanting beaches only a few minutes drive away. Aqualand Waterpark and golf course nearby. We have 2, 3 and 4 beded rooms, all with balcony viewing our swimming pool and the beautiful surrounding landscape. It is ideal for families, groups or partners. Free parking available. Open all year . Cancellation has to be made at least 5 days before arriving day. From Corfu town ask for the road to Aqualand Waterpark in Agios Ioannis village. After the Aqualand drive straight towards the street to Paleokastritsa. You willl see us on the left hand side in Ropa Valley. The next bus stop is only 5 minutes walk away.